In the 18th century, a special geographical feature drew pioneers like Vitus Bering to the Far East of Russia. The continental watershed between the Arctic Ocean and the Sea of Okhotsk is not far from two neighboring rivers, the Yudoma and the Urak. Waterways on each side of the watershed can be connected – with short carrying distances in between – to form one continuous route at the eastern end of the Siberian landmass. We are also attracted to this unique feature. Equipped with two inflatable boats, our adventure would take place in an unspoilt and almost deserted landscape. Hardly any tourists find their way to the isolated Suntar-Khayata Mountains at an altitude of up to 3000m. The rain arrived before we did – more rain, the locals told us, than they had ever seen before. The floods destroyed two bridges which we had to cross to get there. After my travel partner Jakob and I had brought our equipment all the way to Yakutsk (capital city of the Autonomous Russian Republic of Sacha, also called Yakutia), we had to wait for three days until the floodwaters had subsided. After a long delay, we take the ferry across the kilometer-wide rivers of Lena and Aldan and further on the dirt road, in total 800km towards the east. The so-called ‘Road of Bones’ is one of the few paved roads in Yakutia, built by Stalin to connect Yakutsk and Magadan. So many Gulag prisoners died building the road that it is said it was built on their bones. In the highlands, construction vehicles often pull our UAZ four-wheel drive through rivers because the bridges have not yet been rebuilt. Finally, after 27 hours of driving, we reach the area of Oymyakon where the next stage is awaiting us. We use packhorses from here. At the agreed meeting point, we find horse guide Semjon and his nephew Danil. Both are members of the Evens tribe, which only has around 12,000 members now, and whose language is endangered. Unfortunately, they did not bring a riding horse for each of us, but only one riding horse and five pack horses, one of which is sick. It means that we cannot ride the 150km through the valley of the Suntar River into the mountains, but have to walk instead. Daily stages of 20 to 40km would not be a big problem back home. However, here it becomes martyrdom. A third of the route is swamp, where we sink in to our ankles, sometimes up to our knees; the rest is forest with thick, mossy ground, scrub, boulders, river crossings and only short stretches of firm ground. We walk from morning until nightfall each day. As a result of the bad terrain underfoot, my collateral ligaments and my Achilles tendons become inflamed, so that I can only manage the long marches with painkillers. Jakob is also beset with pain to ligaments and heels, and our supply of plasters (Leukoplast) is slowly coming to an end. Finally, we succeed in covering the 140km distance to the valley’s end in five days. The ever more impressive mountain landscape makes up for the torture. When we reach the forest boundary, the two Evens reveal more bad news: we cannot use the horses as pack horses any more because, for lack of trees, we cannot tie them up to load and unload them. Loading the kicking horses every morning was an hour-long procedure that our companions only managed by tying the animals to thick trees. Thus, we divide provisions for another three weeks, two inflatable boats and the rest of the equipment over four pack bags which Jakob and I have to haul over the pass on foot. But the horse guides tell us the river is not far away, and we’ll return the way we have come. From then on, progress means each of us heaving two 35kg pack bags along the route. We walk with one pack, rush back, and return with the second. By proceeding this way, counting two journeys forward and one way back, we manage an average speed forward of one kilometer per hour and a range of around eight kilometers per day. It’s arduous, and agonizingly slow progress. At the other side of the pass, the valley of the Nitkan River opens up – this is the upper stretch of the Yudoma River. 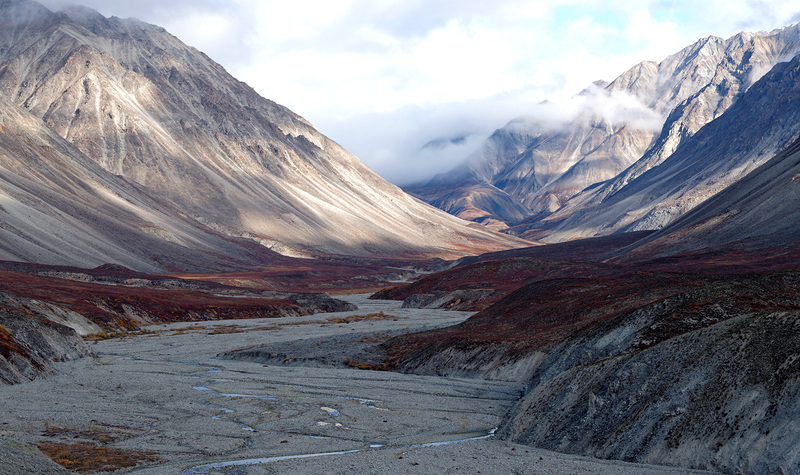 We see red tundra, rocky gorges and boulders, but unfortunately the mountain stream isn’t deep enough to paddle. The glacier is hardly feeding in any water because of the severe night frosts. Our exhausted bodies are crying out for a rest day but, due to the limited time and supplies, we cannot take a break. On the fifth day after parting with the horses, and when the Nitkan River is still trickling away into the ground, we come close to desperation and exhaustion. All items which are not totally essential are left behind. The tributary valleys we’d crossed had offered dry gravel in abundance but little water. According to the map, the next tributary is the last for a long time – and our last chance. Indeed, at the promised rock, the dried-out river appears once more. Is it going to dry out soon again? Hoping fervently that it will not, we blow up the boats and load them. Sitting inside a boat after ten days of marching feels like a quantum jump. Effortlessly and with giddying speed, we move forward with the power of the water. We immediately manage a day stage of 45km – interrupted only by having to get out to tow the boats along shallows every now and again. Stages up to 70km are to follow. It’s a huge relief. We use two one-person blow-up boats, each eight kilos in weight. Running the river so fast gives us the impression that it is constantly changing its appearance – from a steep mountain stream, braided sections in a wide gravel bed, to a slow meander. We will never forget the scenic ‘Gates of the Yudoma’, where the river cuts through vertical cliffs. There is little time for fishing, but we manage to catch some of the famous Siberian taimen, a predatory, remote relative of trout that can grow up to more than one and a half meters. Because of the delay at the start, we still do not know if we can win the race against time and reach Okhotsk before our visas – and our supplies – run out. The GPS shows us that we have reached the place where we should leave the waterway and attempt the portage across the continental watershed. Around 20km, as the crow flies, separate us from the River Ketanda in the catchment area of the Sea of Okhotsk. For days we have been discussing if we should master the portage again in expedition style (walking twice with half the luggage) or in alpine style (all the luggage at once). As we have eaten most of the food, the weight has gone down but is still more than 40kg each. We go for alpine style and pack up our packages – cumbersome shapes which can only be carried (and borne) with pain. The following days are the toughest of the tour. The terrain is hilly and frequently very wet. Crossing swamps with such heavy luggage is an almost inhuman challenge. When you climb up knee-height sedge tufts, they bend and often you slip backwards. Step into the hollows between them and you sink up to your knees in a bog. Sometimes we need an hour to cover a few hundred metres. Finally, we reach the River Ketanda on the other side of the watershed, where gold-yellow larches await us on the riverbanks. We observe sea eagles, gulls, ospreys and brown bears. Animal life is much more diverse here than it was at the Yudoma, thanks to the Coho salmon, swimming upstream from the Sea of Okhotsk – rich nourishment for the animals of the land and the air. We get up early and paddle until dawn, covering an astonishing distance compared to our earlier struggles. The daily average is 55km. At the confluence of the Ketanda with the Urak, we suddenly find ourselves on a really big river, branching out in a kilometer-wide gravel bed. We can already smell the sea in the headwind. As the last challenge of the journey, we master a quick breakout stretch of white water Class III to IV, delighting in the surging water and splashing foam. Then we gobble up more kilometers with ever slower and more exhausted paddle strokes. Just in time on the evening before our return flights, we reach the brackish bay at the mouth of the Urak into the sea. A wave of happiness overcomes us. In total over the last four weeks, we have travelled 500km on water and 250km on foot over the most difficult terrain. By chance, a four-wheel drive stops on the beach and a friendly Russian man organizes transport for us into the city of Okhotsk – 40km away – including a crossing of the Okhota River with a motorboat. After arriving here, Vitus Bering would have built an ocean-going boat with his team to sail off to Kamchatka to spend the winter. In the following summer, he travelled further to Alaska – across the Bering Sea, later named after him. So, while we took the comfortable flight back home, for the previous explorers the real adventure had only just begun.